Our Afghan fishmonger friends on the North End Road frequently have delicious sea bass on special offer. It comes in various sizes, the smaller and medium ones can be stuffed and served whole. Portion wise it's one fish per person. We usually wrap them "en papillote" with a little lime, ginger, chilli, soy and mirin and steam in the bamboo steamer for about 20 mins. With the larger fish we can get two portions from each. The fishmonger will fillet it and save me the head and bones with which I make a quick stock* The two fillets are very easy and quick to cook and the quality of fish is so good the golden rule "Simplest is Best" always applies here. Simply smear a little olive oil over the fish, sprinkle salt over the skin and place skin side down on a reasonably hot pan. If the fish buckles sightly keep it pressed down with a fish slice. Cooking it on the skin side protects the flesh from burning so about 85 - 90% of the cooking should be done on this side. After about three mins turn the fillet over and finish off on the flesh side. Remove from the heat and hold in a warm oven if necessary. The residual heat will cook the fish through. To garnish cut a lemon in thick slices, rub some olive oil on the cut sides and place on a hot pan for 2 mins. The lemon will caramelise slightly giving an attractive appearance and extra flavour. This can be done in advance as they will keep for several days. The fish looks best if served on a little nest of wilted and drained spinach leaves or for something a little different try using laver seaweed. We buy the dried variety in China Town which just requires re-hydration with a little hot water. It can be salty so do not add any. We find a little cracked blacked pepper and sesame oil are best good additions. 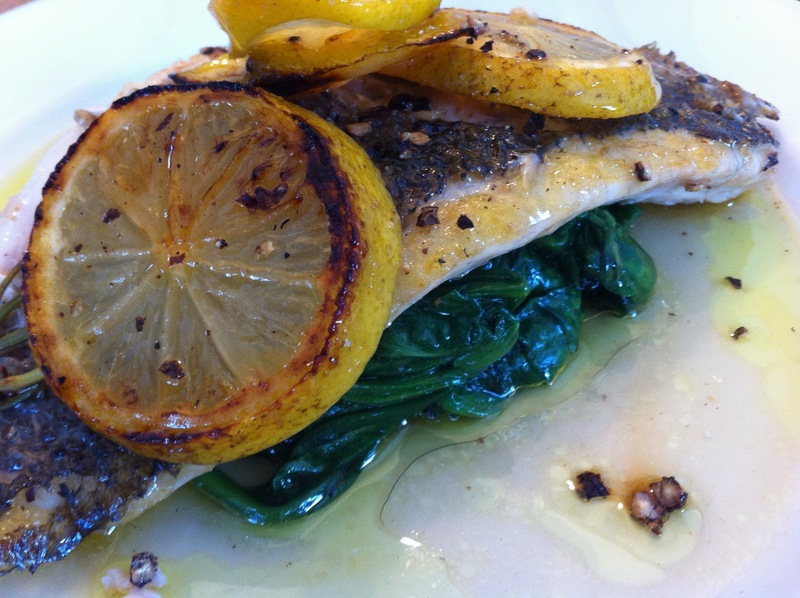 To serve lay the fillet over the spinach or seaweed, drizzle with olive oil and sprinkle with crushed black pepper. * To make fish stock wash the head and bones clean under running water. This helps prevent any scum forming on the surface of the stock. Cover the fish bones with hot water and simmer for about 15 minutes. Then drain and save the stock for future use. We put our stocks in freezer containers, label them and freeze for future use. Always handy!